Bartlesville High will have its season opener at home against Owasso on Tuesday evening. It is a Frontier Valley Conference double-header right off the bat for BHS. Neither Owasso team has played a game yet this season, either. On the girl’s side first, the Lady Bruins will get a chance to knock off the defending state champions. Bartlesville won the conference going away – and beat Owasso in the regular season a year ago – But it was the Lady Rams who took home the 6A crown, after the Lady Bruins lost in the first round of the state tournament. Head coach Donnie Martin says he is looking forward to seeing what this season can bring. BHS returns three regular rotation players, including Nevada signee Jena' Williams, Trinity Parker and Rachael Simpson. Expect Coach Martin’s daughter Chloe, a Pittsburg State commit, to make a big splash as well. On the guy’s side, it should be an experienced senior-laden club for Bartlesville this year. Seven seniors pepper the roster for the Bruins, who also return three starters and two of their top three scorers from 2017-18. Owasso was a regional host and top-10 team in the state a season ago. Bartlesville head coach Clent Stewart talks about the Rams. 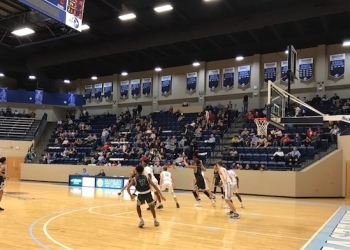 Tayo Dina, Jaylin Oliver, Shane Simpson, Tom Beard and Holden Bryant highlight the returners who played major minutes last year for the Bartlesville guys. Girls tip off at 6:30 with the boys to follow around 8:00. You can listen on KWON – AM 1400 and FM 93.3, on the Bartlesville Radio App and BartlesvilleRadio.com.